It's the start of something new, a new adventure or journey. 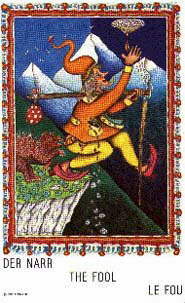 The Fool is usually depicted stepping off the edge of a cliff - a leap of faith into the unknown. But he's also looking upwards, full of optimism and kind of carefree. There is an element of naïveté, thoughtlessness, immaturity, lack of responsibility, impulsiveness or lawlessness to this card though, so be aware of that.